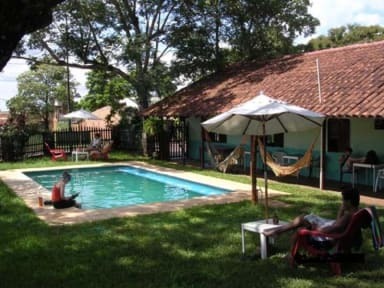 The hostel has a large garden with a hammock to relax in, a barbecue grill and a ping pong table. It also has a TV room and reading room. 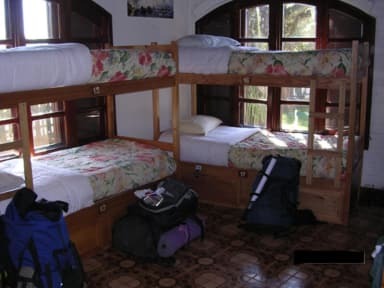 It has shared rooms and private rooms and breakfast and internet is included for just a few extra pesos. Shared rooms have 6 or 8 beds with private lockers under the beds. Private rooms have a double bed and a twin with our without air conditioning. We offer a 24 hour laundry service and a fully equipped kitchen. The hostel has 7 bathrooms, all of which have 24 hour hot water. Our front desk is also open 24 hours. Prima hostel: ik zat in de vrouwenkamer en die is heel ruim. Er is ook een klein zwembadje. Het hostel ligt 50 meter vh busstation, dus ideale locatie om naar de watervallen te gaan. Really nice hostel. Rooms with sitcom. Outdoor area is great (with pool), walking distance from the bus station, supermarket etc. Breakfast is basic. Locatie geweldig, vlak bij het busstation - personeel erg aardig en het gebouw wat oud en krakkemikkig. Handdoeken roken binnen no time naar natte hond en de wifi werkte 80% van de tijd niet. You get what you pay for. When I stayed overhere there was a loud group of people who made a party in the hostel until 4 am. The management didn't even cared, they even played music that loud. For the rest a good location, close to the bus station and they have a swimming pool. Rooms are clean, matras of the bed is really thin so not nice to sleep on. Rooms are not locked, they stay open..